Hyderabad based Indian School of Business has slipped by 7 ranks from 13th to 20th in the Global Top MBA rankings 2012 released by the Financial Times, London. 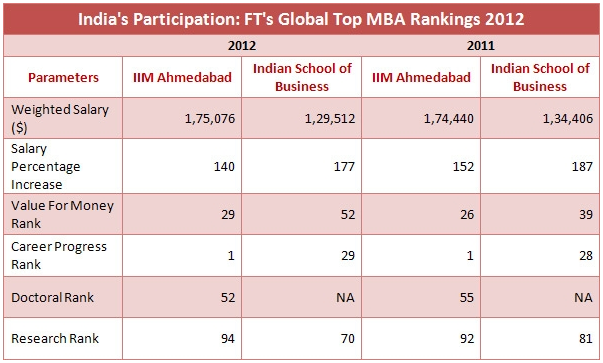 IIM Ahmedabad on the other hand has maintained its 11th position in the FT rankings this year too. ISB and IIM-A are the only Indian business schools featured on the FT rankings. IIM Ahmedabad is ranked the top business school in terms of Career progression. ISB's career progress rank is 29th. The weighted salary of IIM Ahmedabad stands at $175,076 whereas; the weighted salary for ISB is $129,512. IIM Ahmedabad's weighted salary is marginally up this year by $636, closing to Harvard Business School's who's weighted salary is $178,249. The weighted salary for ISB on the other hand is $129,512 down by %4,894. The IIM Ahmedabad is ranked 29th on the value for money parameter, 23 positions higher than ISB's 52nd rank. The overall salary percentage increase at IIM Ahmedabad is 140 per cent down by 12 per cent as compared to last year's increase. ISB on the other hand recorded salary percentage increase of 177 per cent this year. One of the factors for ISB's comparatively overall lower rank may be its lack of participation in the doctoral rank category in which IIM Ahmedabad has scored 52nd rank. Also the IIM Ahmedabad's research rank was 92 this year, 11 positions below ISB's 70th rank. US based Stanford Graduate School of Business, Harvard Business School and University of Pennsylvania's Wharton are ranked first, second and third respectively. China's Hong Kong UST Business School is ranked tenth and National University of Singapore's School of Business is ranked 23rd. Has anyone heard about MBA in Rural management & Agribusiness(New Programme) offered by KIIT School of Rural Management?? Having achieved highest standards for its flagship programme of MBA (Rural Management), KSRM is now moving closer to realizing its vision to become a leading global academic institution in the field of Rural Management.